Eight years ago, I asked the Ouija Board a question that will forever haunt me. (If you know anything about this "psychic" game, you know that it should not be messed around with by little Christian girls.) My cousin, Amanda, and I had been attempting to scare one another with our most frightening ghost stories when she decided it would be fun to take our spooky rendezvous to the next level. Quietly, she crept to her closet and pulled out the controversial game from among the shelves. At first, being the scaredy-cat that I was, I refused to play. But eventually, curiosity got the best of me, and my fascination with the supernatural began to outweigh my fear. I agreed, under the condition that she went first. Amanda thought this was a reasonable request and proceeded to ask whether she was going to die within the next ten years. Both of us breathed a sigh of relief as the wooden object beneath our fingertips slowly made its way to the area marked "No." Next was my turn. I specifically remember wanting to ask the Ouija if any spirits were in the room with us. For some reason, the idea of having an actual ghost present at our midnight fright-fest excited me. (Apparently, I was a very disturbed preteen.) But Amanda would not allow it; this was, in fact, the bedroom that she slept in every night, and she did not care to know about any invisible roommates that might have been lurking. Instead, for lack of a better question, I followed my cousin's lead by inquiring about my own death (a mistake, to say the least). "In how many years will I die?" was my bold inquiry. As the planchette began to move, I kept my eyes pinned to the board in anticipation of the response that I would receive. It seemed like several slow minutes had passed before the clear circle in the center fully encompassed the number eight—a good first digit, I thought, as I braced myself for the uncovering of the second. But I quickly realized, to my utter horror, that the planchette was no longer in motion—it had arrived at its answer. 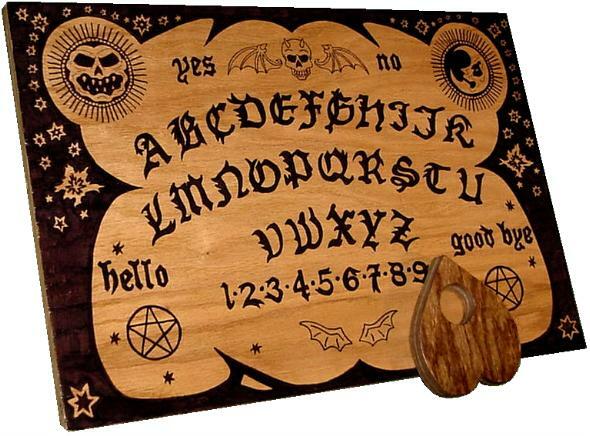 The demonic forces of the Ouija had spoken, and no amount of mental pleading was going to change that. My whole body froze as the reality of this terrible discovery began to sink in. At eleven years old, I was almost too curious, more than a little naive, and scared of absolutely everything. And, sadly, I was convinced that I was going to die at the young and lively age of nineteen. You may be wondering if, after all these years, I still buy into the idea that my life will be cut short because of a ridiculous game. Well, I'm pretty sure you can answer that one for yourself. To be honest, the thought of such a silly prediction coming true amuses me to the point of laughter. But for whatever reason, this childhood memory has never completely left me; it lingers in my subconscious and is only brought to the forefront of my mind on the rarest occasions. Like tonight, for instance, on the eve of my 19th birthday. Let's just say, I'm determined to make it to the big two-oh. You are cordially invited for a hefty piece of Birthday Cake, just give my name a click! Happy Birthday to us!